Since its establishment by the Irish Government in 1936, Aer Lingus has gone from strength to strength and has even flown some notable figures, including Pope John Paul 2, along its routes. Winner of the “Best Airline to Europe”, “Best Airline to North America” and “Best Short Haul Airline” at the Irish Travel Awards in 2014, you can enjoy the best of Aer Lingus’ award-winning service. Has code share agreements with top alliances like Oneworld, Star Alliance and SkyTeam, servicing major routes all around the world. Aer Lingus is an Irish inspired airline which roots are deeply ingrained in their hub city of Dublin, while smaller operating bases can be found in Belfast, Cork and at Shannon Airport. The name Aer Lingus is derived from the Irish 'long' meaning 'ship' and is therefore translated as 'Air Fleet'. Aer Lingus’ distinct green coated aircraft fleet sporting the traditional Irish Shamrock as its moniker gives you a real sense of its commitment and national pride. With 2017 marking 81 years of operation for the airline, it’s safe to say they have much more than the luck of the Irish on their side. 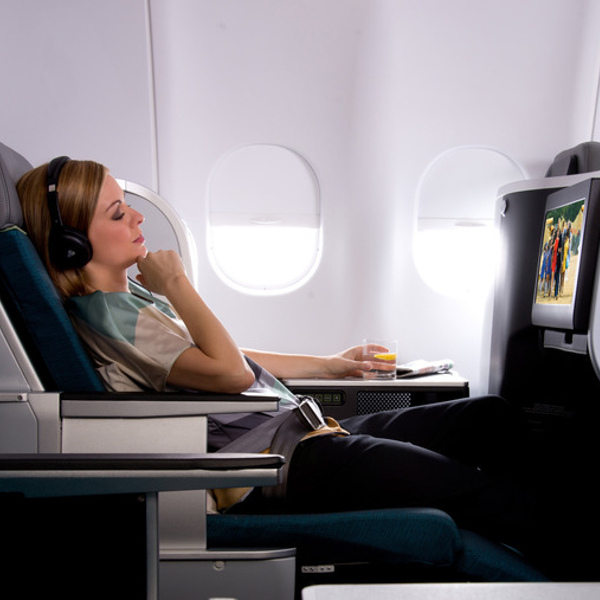 Book Aer Lingus flights to Dublin, Brussels, Amsterdam and other exciting places! Book in advance and save on checked baggage fees! Check baggage policies and restrictions on the Aer Lingus website. Passengers are allowed to take onboard hand luggage of a max weight of 10kg for international flights and 7kg for regional flights. 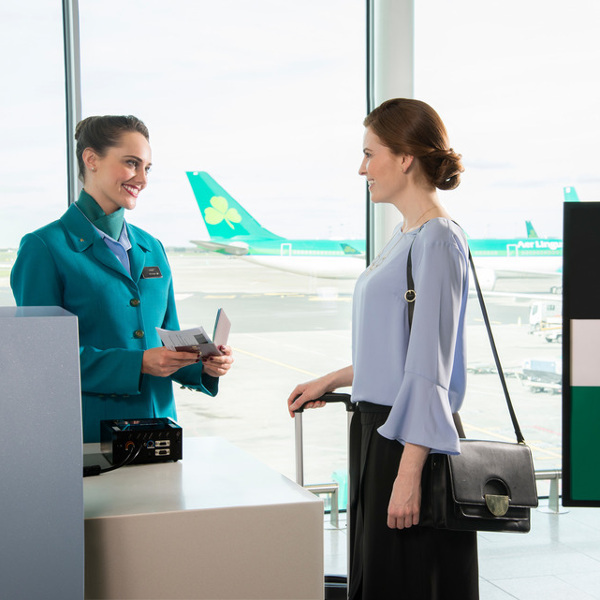 • Please note that if you’re connecting from our Aer Lingus service to our Aer Lingus Regional service, the 7kg (15lb) cabin baggage allowance will apply for both parts of the journey. • Please ensure your cabin baggage is within the specified allowance. Bags outside of this allowance must be checked in and the relevant bag fee will apply. • Flights departing for the U.S. are subject to Transportation Security Administration (TSA) rules. • Revised from 31 January 2014, EU security rules regarding liquids, gels and aerosols in cabin baggage apply. Aer Lingus allows its passengers 3 ways to check in. Travellers are able to use the traditional method of checking in at the airport but, please be advised that this will require that you show up early, to allow for check in and security screenings. For North American flights, arrive 3h 30mins before departure, as check-in closes 75 mins prior to departure. For European flights, arrive 2h 30mins before departure, as check-in closes 45 mins prior to departure. Flights from Belfast, arrive 2h 30mins before departure, as check-in closes 30 mins prior to departure. You can use their web check-in between 2 and 30 hours before your scheduled departure time. For transatlantic travel, you can use web check-in between 2 and 24 hours in advance of your departure time. On selected European routes, you can use the 30-day advance check-in between 30 days and 30 hours before your scheduled departure time. Please note a seat fee must be bought in order to advance check-in. Check-in procedures and timings applying to routes for mobile check-in are the same as mentioned above for online check-in. For convenient check-in within Europe between 2 and 30 hours prior to departure, download the Aer Lingus App and access your boarding pass in a few easy steps. These are the majority seats on the aircraft. Select between window and aisle seats by pre-booking your selection. By purchasing a “Choice Seat”, you are entitled to the priority boarding service and, being seated at the front of the aircraft, you’ll be first off the plane when you arrive at your destination. By purchasing an “Exit Seat”, you are not only entitled to the priority boarding service, but you will be situated at the emergency exit rows, which means extra legroom. Premium seats are lie-flat business class seats with extra legroom, and are only available on A330 operated flights to Malaga and Faro during peak season times. Movies on demand, classics, Irish films, shorts films, animations, TV Shows, radio and music channels… the list is endless, providing you with hours of entertainment throughout your journey. Surf while you fly. Keep in touch with your friends and family, or keep abreast of your emails all from the comfort of your seat. Business Class passengers surf the internet for free, while Economy passengers can purchase various bundle options. 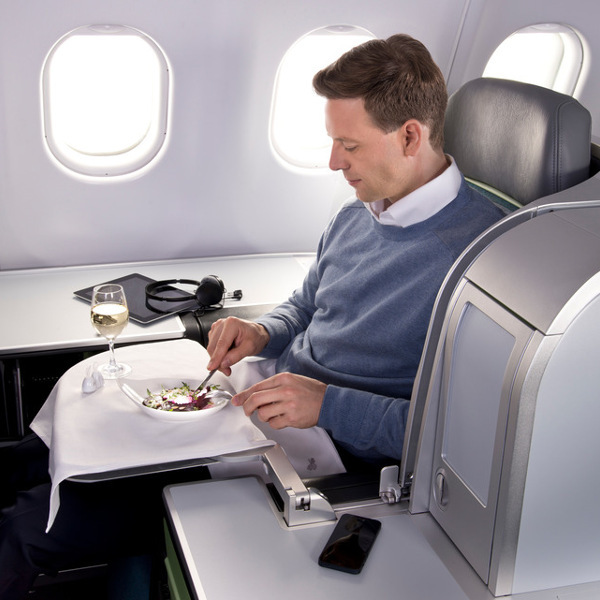 Complimentary meals and refreshments are served on all long-haul (transatlantic) flights. Aer Lingus currently has a fleet of 46 aircrafts, all variations of the Airbus which service their network of 82 international destinations.